Early afternoon's shadows crept between the barn and house at Cherry Grove Farm and a thin cover of snow softened surrounding fields and forest.ÃÂ Newtown Forest Association (NFA) member Bart Smith on December 16 welcomed nearly 40 guests who had answered the NFA's invitation to join a guided walk through the former agricultural site now reclaimed by common juniper and other shrubs and trees. The juniper thrives on the field's edge until larger trees overshadow its low-spread branches. NFA is in negotiations to purchase roughly 30 acres of Cherry Grove's farmland from Sandy Hook resident Greg Carnrick, a developer who purchased the farm at the intersections of Platt's Hill, Palestine, Hundred Acres, and Beaver Dam Roads in November. 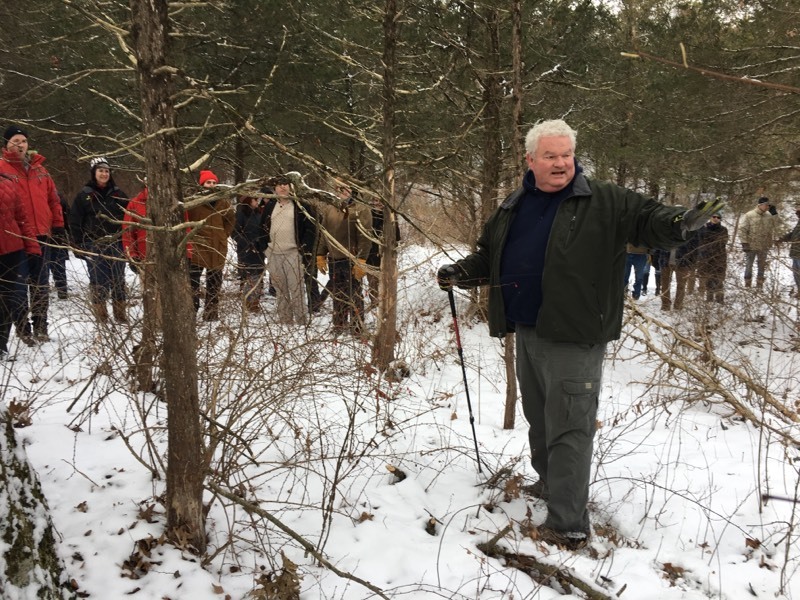 NFA welcomed residents for the site walk earlier this month, taking them through fields and groves, past an old one-room schoolhouse, and pausing at gnarled trees with branches and bark now crumbling. Glancing at the land, Mr Smith said development could take place if NFA is unsuccessful in its quest to purchase the property. NFA has until mid-January to raise $600,000 to acquire the property. ItÃÂ had raised only about one third of that amount as of the afternoon of the walk. 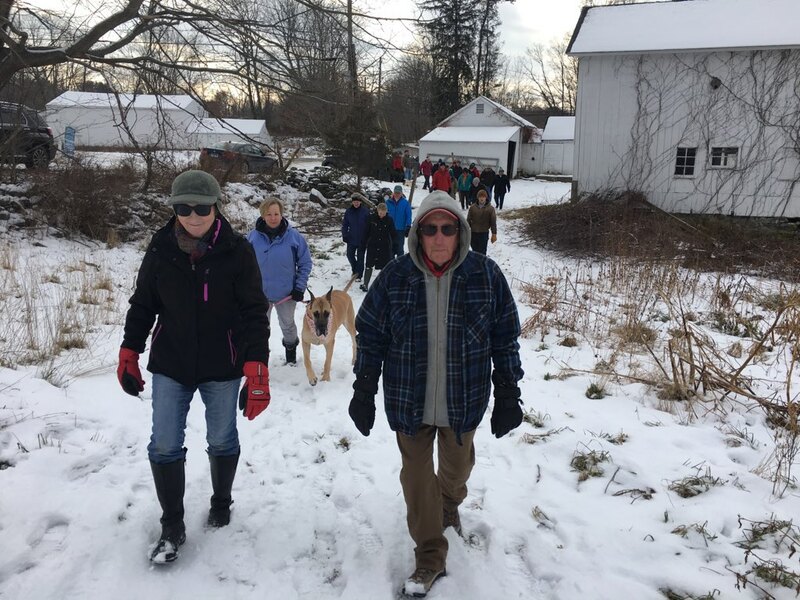 According to Mr Smith, who offered a brief history during the December 16 walk, the Mayer family had owned the farm since 1912.ÃÂ The land has been farmed as far back as the Revolutionary War, however. In addition, the former Beers family farmhouse, which is being sold separately, dates back to the Civil War era. "If we don't preserve this, you may be some of the last people to walk it. It's dire. This is a great property," he said. NFA President Robert Eckenrode said, "The [property] owner wants to move forward and wants to develop, so either we preserve it or it is cut into lots. "There is not a lot of time," he noted. 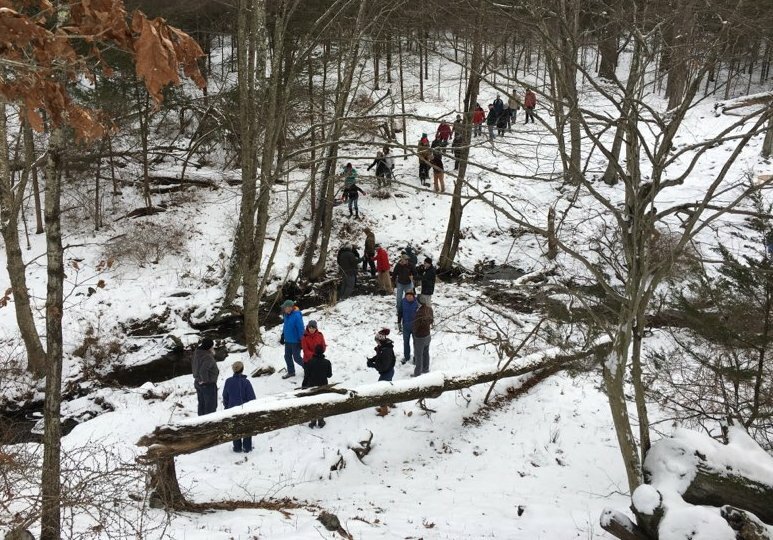 NFA member and arborist Dan Dalton led the recent hike. Stabbing his walking stick into the snow, he strode across uneven ground toward shrubs, then cedars, and finally a denser wooded area. "Interesting" to him were the visible "patterns of past use" that he could glean from the flora. He believes the field was once plowed and grazed. He mentioned farmers coming across stones and heaving them aside, and pointed to one of many familiar New England stone walls veining the property. As agricultural uses faded, then came a succession into a cedar forest. Older cedars have multistems because as cows grazed, the cedar would rout new growth, he said. Shaking the snow from a knee-high, broad shrub, Mr Dalton said, "So cool. Common juniper; it's not that common." Although it has the "widest range of any shrub, it has specific requirements." In particular, it needs sunlight. As red cedars grew in, the common juniper was shaded out. He walked under the taller cedar grove where he noted the dried husks of common juniper, unlike the green and vibrant plant in the field. Again he headed through the growth saying, "no trails," and that rather than a walk they were on a ramble. Down a slope and across a stream, then up a rise, Mr Dalton waited for the group to gather. "We're on top of a glacial deposit," he said. He passed a large white oak growing "where no one bothered it." Mr Dalton then stopped in another field saying, "You can see where it goes from plowed land to grasses to woody plants." At the edge of the field sat a small white schoolhouse, already purchased by another property owner who is relocating the structure to another site. 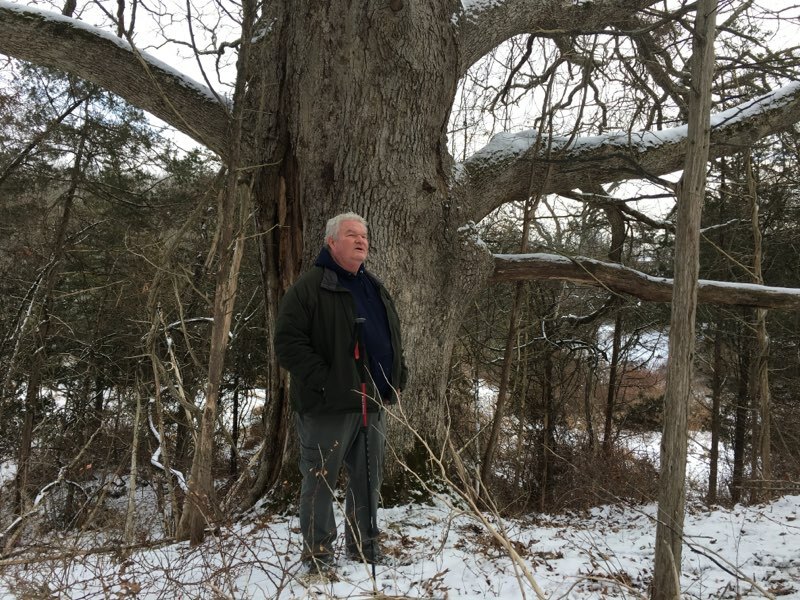 Standing beside a massive oak that has been "dead for decades," Mr Dalton pointed to the dead cedars and black birch withered beside its trunk and under its wide canopy. The oak likes to take the resources it can, such as sunlight, he said. "Life or death competition in the forest" was visible around him, he said. Mr Carnrick, the new owner of Cherry Grove Farm, is also owner of GRC Construction LLC. The land is a collection of meadows, streams, and forestland. Concerned with expansive development, the NFA reached an agreement to save and preserve a majority of the farm. It is not Mr Carnrick's intention to ruin the land, he said. He reached out, offering an opportunity to preserve some of the parcel, and the NFA made contact with him. While "things need to make financial sense" for him, he also hopes to see farmland in his hometown preserved. "I grew up here, and I remember Great Ring Farm, and when Yogananda was all farm fields," he said, naming two streets in Sandy Hook that formerly housed expansive farms.ÃÂ While he is in the business of development, he also wants to work with the town and NFA. "I feel good about it," he said. Mr Carnrick had initially intended to set aside 12 acres as an open space area in the farm purchase. If NFA is able to raise the money necessary, their parcel will add to the preserved land. When NFA showed interest, Mr Carnrick was willing to work with them, he said. Mr Carnrick had hoped the town open space fund could be utilized for open space purchase, but funds are not available, NFA members confirmed. Mr Carnrick has selected a dozen acres of open space, with access trails he will build from Beaver Dam and Palestine Roads for the public to enjoy.